During the setup of Mini, I found a good feature about Vista. For anyone who bought new machine from Dell or HP or even from those shops in Imbi and Low Yat, the machine always pre-loaded with Windows in the internal harddisk. If it's Windows XP and the harddisk is a big giant, say 250GB, you will have a C drive loaded with XP and to keep all your data such as documents, photos into C as well. Bad mouth and touch wood, if something goes wrong with the operating system i.e. 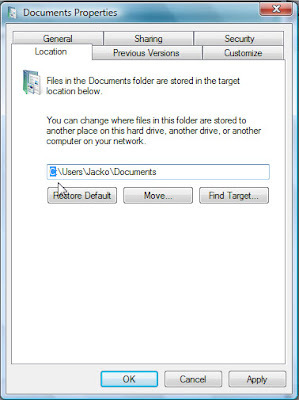 virus infection and needing a fresh install, you would be headache on data recovery. 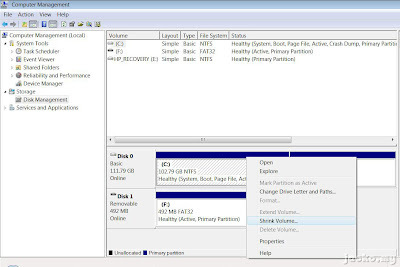 For techie, we always recommend to split the harddisk into at least 2 partitions, one for the system and one for user data. There are generally 2 options (exclude more advanced options) to do so. The usual one for techie is to wipe off the pre-loaded OS with a fresh install. Doing so might wipe off the easy recovery option that generally comes with brands like Dell or HP. A fresh install, in particular Windows XP requires a prior planning on the disk space so sufficient size is reserved and allocated to system drive (C). A mistake in disk space allocation (for system) would require another round of fresh install. Some brand like Dell actually helps the customers to do this so called "partitioning" to split the harddisk into 2 logical drives upon order confirmation, of course not free but with charges. Alternatively, the techie would load some software such as Partition Magic to split the harddisk space without working the need of reinstallation. Such software comes with advanced features that non-techie might not familiar with, a mistake might return you to origin - to perform a fresh install and worse, data loss. Even with the latest version of Partition Magic, v8.0, there is no support for Vista and therefore virtually I was left with only the tedious process of fresh install Vista Home Basic if I were to do repartition on Mini's harddisk. 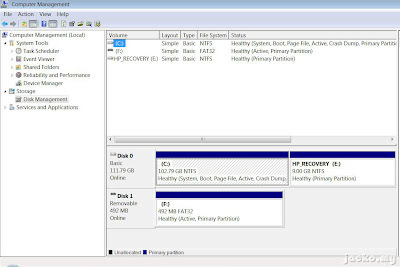 More challenge, HP does not provide any system recovery CD with the Mini!! So how the hell could I reinstall the OS?! Shrink is to make the current partition smaller size so extra space can be used to create a new partition. This was what I wanted to do, to shrink 120GB of C drive into smaller size so I could create a new partition for user data. Extend is to grab more disk space to expand the current partition. This is useful when the system drive is running out of space i.e. it was partitioned with too little space in the past, more program installation needs more space. In XP, you would need to reinstall the OS or use Partition Magic to do so. I'm not gonna cover the detailed step-by-step over here, it's straight forward and wizard base. Don't worry, unlike Partition Magic or other advanced partition software, you can't go wrong with this feature in Vista, the only thing is to make sure you are NOT deleting a volume that contains data. Condolence to your data if you've done so. For instance, shown above, the Documents folder. Don't use Cut-and-Paste (C&P) method! Right click on the folder -> Properties -> click on Location tab. If the new drive is D, I recommend just change C to D, click Apply, Yes or OK to the warning and Yes again to move all contents from the original folder to the new one. You don't have to use the Move or Find Target buttons at all. Now, your data should be safe in case of system crash or Windows failure. P/S: Ohya, to access Disk Management, go to Control Panel -> Administrative Tools -> Computer Management.